NCERT Solutions for Class 10 English Chapter 1 Two Gentlemen Of Verona are provided here with simple step-by-step explanations. These solutions for Two Gentlemen Of Verona are extremely popular among class 10 students for English Two Gentlemen Of Verona Solutions come handy for quickly completing your homework and preparing for exams. All questions and answers from the NCERT Book of class 10 English Chapter 1 are provided here for you for free. You will also love the ad-free experience on Meritnation’s NCERT Solutions. All NCERT Solutions for class 10 English are prepared by experts and are 100% accurate. What are the qualities of a "gentleman"? Work with your partner and complete the following web-chart by listing the qualities of a gentleman. Based on your discussion above, what do you think the story is about? 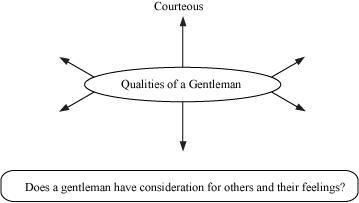 The story could be about whether the protagonists are truly gentlemanly or not, based on the qualities listed above. The narrator was surprised to see the boys shining shoes because he thought that they sold fruits for a living. However, when he questioned the boys regarding this, Nicola said that they also did a lot of other things for a living. The boys hoped that the narrator would ask for their services and in return would earn some good money. The narrator was astonished to see that boys worked hard day and night and yet lived meagerly. He wanted to know what the boys did with the money they earned. When he questioned Nicola, he appeared uncomfortable. Perhaps the boys were not used to anybody questioning them regarding their earnings, and the narrator’s question embarrassed them. When the narrator suggested that the boys were saving to emigrate to the States. Nicola responded that how much ever they wished to do that, currently they had other plans, which he was unwilling to and uncomfortable sharing with the narrator. Although the boys were small and innocent, there was a maturity in their demeanour, which was unbelievable at their age. Luigi judged the two boys by their appearance. He did not approve of the two boys because they were shabbily dressed and he thought that they might sell bad fruit. The narrator and his companion were surprised that the boys were doing so many things at such a young age. Under the hot sun they sold fruits, newspapers, ran errands and were tourist guides as well. They did any odd job that they were asked to do. Their willingness to do any kind of work impressed the narrator and his companion. The narrator was surprised to see Nicola and Jacopo shining shoes because he thought that selling fruits was their only occupancy. The boys did everything the narrator and his companion asked them to do: they showed them around the city, bought tickets for the opera for them, told them about good restaurants and ran all their errands. The boys were waiting for the last bus from Padua so that they could sell all their papers. This explains the fact that the two boys were very hardworking and dedicated. The narrator asks the boys, "Must you work so hard? You both look rather tired." The boys reply, "We are not complaining, sir." What do you learn about the boys from their reply? The boys were very focused and committed. Their only motive was to pay for their sister’s treatment. They did not care for their comfort but tirelessly worked hard to earn money. The two boys did not want the narrator to know of their problems because they were strong and courageous kids in the face of adversity who did not want a stranger to sympathise with them. They were confident kids who would rather work hard and earn in order to find solutions of the same on their own. The narrative began with description of the shabby appearance of the two boys—Nicola and Jacopo. In spite of their appearance, the narrator bought fruit from them. In the following days, the narrator discovered that the boys did a lot of other things apart from selling fruit: they sold newspapers, they were shoeshine boys, tourist guides and ran errands. All this made the narrator think that the boys were working so hard to save money to emigrate to America. However, it is revealed during the course of the story that their only motive was to be able to pay for their sister’s treatment. War had destroyed most of their family and yet it had not filled them with despair. The boys were working day and night to save whatever was left. Behind their shabby appearances were hidden two noble souls whose dedication and selflessness promises a new hope for mankind. The boys loved their sister. She was the only family left after the war was over. When they realized that their sister had tuberculosis of the spine, they got her admitted to a hospital. They worked hard day and night to pay for her treatment. They visited their sister every Sunday in the hospital. They could have emigrated to the states but they chose to stay back and look after their sister. They didn’t want to lose her. The war had destroyed everything the boys had. They lost their home and their father was killed in the war as well. Until the war they led a cultured and comfortable life. The war had led them to the streets, exposed them to bitter cold and driven them to extreme starvation. However, it did not fill them with despair. They set to build what was left after the war. They found their sister suffering from tuberculosis of the spine, got her admitted to a hospital and worked very hard to pay for her treatment. The boys’ sacrifice, their devotion and the maturity they displayed at such a young age promises a new hope for the society. The destruction caused by the war had not broken their spirit. Rather it filled them with a new energy to rebuild from what was left after the war. (a) We bought their biggest basket, then set off toward town. (b) One night we came upon them in the windy and deserted square. (d) I shook my head and turned away. 2. Early in the morning we packed our bags and _____________ for a hike over the mountain. 3. Janvi _____________some photographs of her grandfather in the old trunk. 4. My father _____________ his own business 10 years ago. 5. The Bank _____________ Paul's request for a loan. 6. The Corporation's decision to reduce the leave of the employees _____________ a lot of opposition. to start / establish a company. to lose control of your feelings and start crying. to start on a journey. 2. Early in the morning we packed our bags and set off for a hike over the mountain. 3. Janvi came across some photographs of her grandfather in the old trunk. 4. My father set up his own business 10 years ago. 5. The Bank turned down Paul's request for a loan. 6. The Corporation's decision to reduce the leave of the employees come up against a lot of opposition. Two Gentlemen of Verona is written in the first person. A story written in the first person is a first-hand account of events told or narrated through the eyes of a single character, typically the main character. Stories written in the first person are easily identified by the use of the pronoun 'I' rather than 'he or she'. The reader will see phrases such as "I said, I thought," rather than "he said, she thought." Everything is experienced through the eyes of a single character, and all thoughts and observations are limited to that one person. There can be no outside observer. If the narrator does not see or experience an event first-hand, it cannot be a part of the story. All scenes in the story are filtered through this person's unique perception. The third-person is a narrative mode in which both the reader and author observe the situation either through the senses and thoughts of more than one character, or through an overarching godlike perspective that sees and knows everything that happens and everything the characters are thinking. In this mode of narration, the narrator can tell the reader things that the main character does not know, or things that none of the characters know. The driver waited outside until the boys rejoined him, and then drove them back to the city. They sat beside him, not speaking. The driver did not say a word. He thought the boys would prefer to feel that they had safely kept their secret. Yet their devotion had touched him deeply. War had not broken their spirit. Their selfless action brought a new nobility to human life, gave promise of a greater hope for human society. As the narrator, write an article on the lesson of love, faith and trust that you have learnt from the two young boys of Verona. Note: This question is to be answered on the basis of your own understanding, experience and thoughts. It is strongly recommended that you prepare the solution on your own. However, some pointers have been provided for your reference. The narrator’s initial impression of the two boys. Their willingness to do any kind of job. Their regular weekly visits to meet their sister. Their making sure that they regularly pay for her treatment. After her brothers' visit, Lucia writes a page in her diary about her past life and her present situation. As Lucia write the diary entry in about 150 words. The war had destroyed my home. We almost died of starvation and extreme cold. My brothers hated the Germans. They joined the resistance movement. After the war was over, they came back to me but unfortunately I was afflicted with tuberculosis of spine. They admitted me in a hospital. I look forward to their visit. They are working very hard to pay for my treatment. Today they came in a car unlike other times when they cycle 30 kms just to meet me. They told me about this gentleman who especially drove them here. They had shown him Verona. They ran small errands for him. I pray I feel better and be able to walk and sing again. The reason the narrator does not disclose to them that he knows their secret. Nicola initially is not comfortable with the narrator driving them to Poleta. After some thinking they agree. The moment they reach their destination they jump out of the car and do not ask the narrator to come with them. On the other hand, they suggest him to spend time at a café in the village. The narrator understands their reluctance to share their purpose of visit with him and, therefore, does not disclose to them that he knows their secret. How the boys are useful to the narrator and his companion. Jacopo requests the narrator to send them to Poleta in their car which they might not have asked anybody. After initial disagreement between the brothers and reassurance from the narrator they agree to go with him. They are very comfortable and trust him completely. The boys never complain of their circumstances and the hardships they face. They don’t want to reveal as why they are working day and night. They don’t disclose their reason for going to Poleta. The love and devotion, and the family values Nicola and Jacopo display. How war devastated their lives. In spite of contrary circumstances, how they are driven to get back to their family.